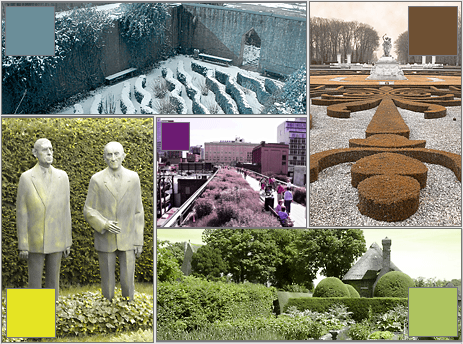 “Imag[in]e the Garden” enables the visitor to undertake a virtual journey between large and small gardens and parks in an initial selection from Northwest Europe, thus facilitating a visual experience of European garden design. The paths trace four European themes which reveal the common roots of European garden design as well as important distinctive features. In addition, it is possible to follow the role of parks and gardens in history and politics, in culture and town development. Often it are the concealed, unknown or hidden parks and gardens which are waiting to be discovered by garden lovers. They are hardly less attractive than more famous parks and gardens and can be explored by visitors in peace and at leisure. If we have awakened your curiosity, why not embark on the visual journey through the parks and gardens, why not let yourself be tempted to make an actual visit? But please also appreciate that a small number of these parks and gardens are only open infrequently or on request: these corners of paradise need care as well as peace and quiet, but reward the patient visitor with unique enjoyment and atmospheric experiences.